Although he showed excellent form on today’s demanding stage of Tirreno-Adriatico, clocking up his fifth win of the year and the 41st of his career, Peter Sagan has warned against any presumptions that he will win Milan-Sanremo. The Cannondale Pro Cycling rider has pinpointed the Classic as his first main goal of the season, yet insists that there are no foregone conclusions in cycling. In Tirreno-Adriatico Sagan has shown three qualities that are often needed to win La Primavera. Today he displayed climbing strength and descending ability, while his victory on stage three proved once again that he has the pure speed needed if it comes down to a big group finish. Thus far, fourth in last year’s race is as close as he has got to winning the Classic. He was only 22 then and now, another season older and more experienced, he will be closely watched by many of the other contenders. These include Fabian Cancellara (RadioShack Leopard), who described Sagan as the five star favourite for the race after that stage three victory. Speaking about today’s success, he said that he worked very hard for the result. “It was a difficult win on a hard day,” he stated. “I didn’t feel really good in the morning, also because to the effort in past few days. The stage result was a boost to both riders, as Nibali took over the blue jersey of race leader from Chris Froome. 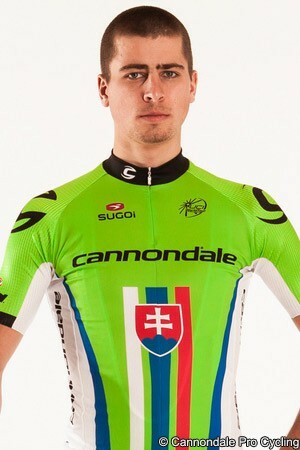 The Italian and Sagan were on the same Liquigas Cannondale team until the end of last year and are friends. As a result Sagan said that there was an understanding between them and the cooperation was good. In addition to that, he said he was pleased to see the Astana rider move into the jersey. Sagan is known for his peculiar victory celebrations and today’s was no different. He raised his arms, then turned his head right and left and kissed his biceps. The reason? The difficulty of the climb scaled three times by the riders. If he does live up to his favourite tag and scoop the win on Sunday, it seems certain that more flamboyant celebrations will be displayed.